We're sorry, our online catalog does not have any entries for your request. 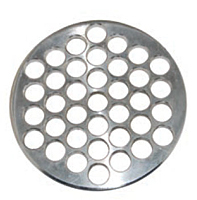 We are constantly adding new products to our online catalog. We are confident that we will be able to find a comparable product. Please email or call with your information and we'll be happy to help. Kurt Hydraulics is a leading manufacturer and distributor of hydraulic hose products, high pressure hydraulic hose fittings, and hose couplings. 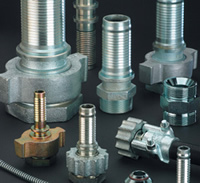 Kurt Hydraulics manufactures only the highest quality high pressure hydraulic hose, high pressure hose fittings, and other hydraulic system components. Their hydraulic hose products meet SAE standards and are designed for use in any hydraulic application. 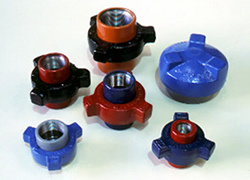 Campbell Fittings, Inc. manufactures industrial hose fittings, couplings, clamps, ferrules, and related tools & accessories for air, steam, gas, water, dry bulk, chemicals, and petroleum applications. Ham-Let Valves and Fittings solutions for the Semiconductor, Biotechnology, Pharmaceutical, Petrochemical and Energy. JGB offers Cam and Groove couplings from many vendors including Dixon, Kuriyama, Banjo, Campbell, Parker / Page International, Goodyear, Chemjoint, PT Coupling and more. JGB carries Dixon Boss Fittings Hammer Unions for various applications including low pressure (< 1000 PSI) all the way up to extreme high pressure applications up to 15,000 PSI.